All rental applications must be in writing. A $50.00 non-refundable application fee (per person) is due with application. All application fees must be paid by check, cashiers check, money order or with a credit card online. Cash is not accepted. Age: All applicants must be 18 years of age or older. Income: Total monthly household income (gross) must be at least three (3) times the amount of the apartments rental rate. Proof of income is required (i.e. pay stubs). Employment: Prospective residents must have gainful and verifiable employment. Recent college graduates will be accepted without this requirement if all other areas of requirements are fulfilled. *See guarantor if the other requirements are not fulfilled. Credit: No unpaid rental related debt (see Rental History), no rental judgments or bankruptcies within the last twelve (12) months. Must pass third party credit screening. Rental History: Applicant must provide one (1) year of rental history. No evictions or unpaid rental related debt would be accepted within the past twenty-four months. No more than two (2) insufficient rent checks will be allowed. Guarantor: A lease guarantor will be accepted for students, recent college graduates, for those who do not have verifiable rental history or do not meet income requirements. Guarantor will submit a completed application and pay an application fee. Guarantor must meet all of the qualifying criteria as well as proof of ability to support rent amount. Self-Employed/Retired: If self-employed or retired the applicant must provide copies of tax returns from the previous year and copies of the three most recent bank statements showing proof of ability to pay rent for the term of the lease. Non-U.S. Citizen: Copy of passport, green card, student ID and/or pay stubs will be required. Pets: Pets are accepted; only non-violent breeds. A non-refundable pet fee of $500 is required per pet. Pet fees are not required for service animals. Any felony conviction including pending cases and serving deferred adjudication or probation for a felony. Applicants rental history that includes court evictions(s) in the past two (2) years, landlord request(s) to leave apartment due to lease violations, or a poor rent payment history. Occupancy Standards: No more than 2 persons per bedroom. Please allow a minimum of three working business days to process your application. 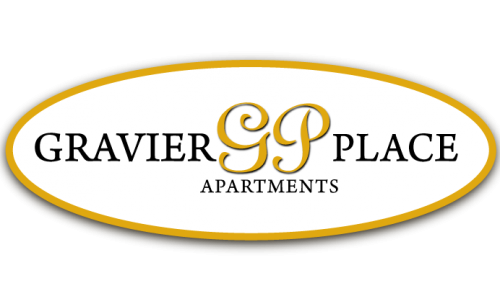 Acceptance of application by the Gravier Place Apartments does not guarantee approval nor does it guarantee the applicant can move in on the day desired. Application process may require additional information from Applicant. All aspects of the process must be completed before final approval and move in. If Application is denied, applicant will be notified by mail. If application is approved, applicant has 72 hours from the time of approval notification to cancel without forfeiture of any holding deposit. Any deposit will be lost if applicant cancels after 72 hours of approval notification.